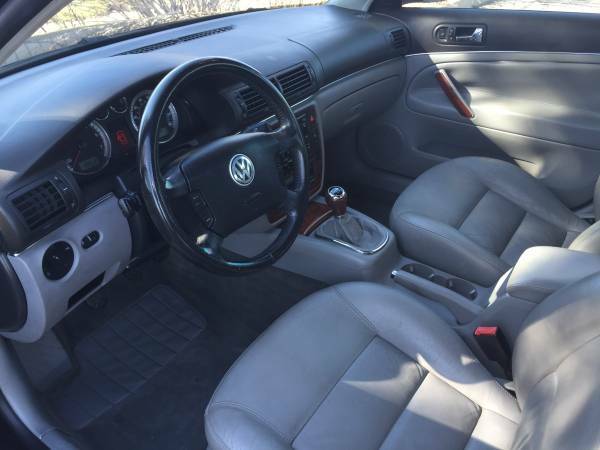 The B5 generation Passat was launched in the 1997 model year with a product that looked/drove/smelled a lot more like an Audi than the previous generation Passat. 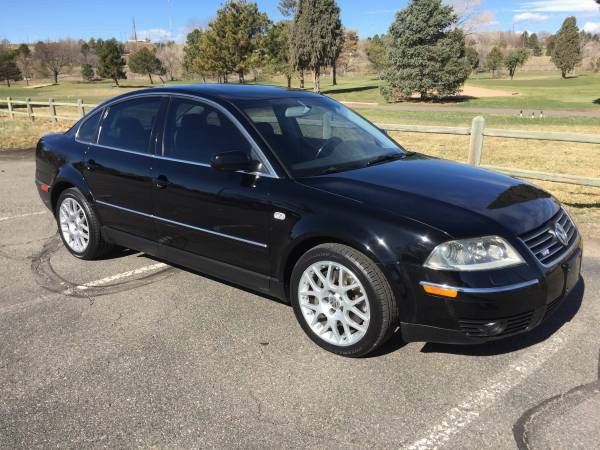 In 2001 Volkswagen introduced the B5.5, a cosmetically refreshed version of the platform that added more chrome trim (inside and out) some fancy taillights and a unique W8 engine option that could have been...if you were lucky...mated to a 6-speed manual. 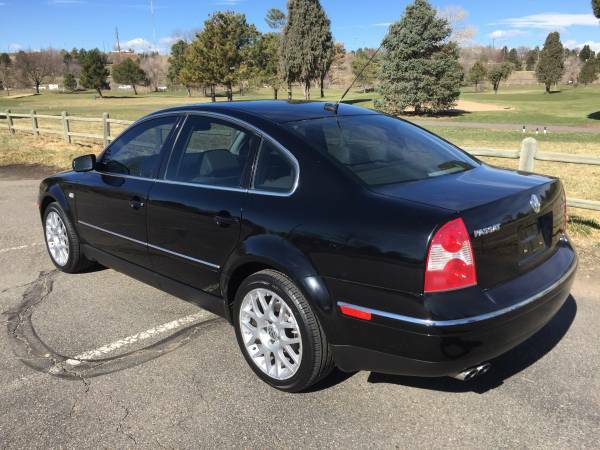 Find this 2004 Volkswagen Passat W8 4Motion offered for $7325 in Denver, CO via craigslist. Tip from Joel. The W8 powered Passat wasn't the fastest 6-speed equipped executive sedan built in Germany, but it was the cheapest when new. The Passat probably didn't steal much market share from BMW's 540, or Mercedes E-Class, but it certainly cross shopped with well equipped Accords and perhaps an Acura, Lexus, or Audi. The B5 (&5.5) chassis is one of the few modern cars to use a longitudinal engine/trans in a front wheel drive automobile, with the compact W8 engine sitting forward of the front axle. It displaces 4.0 liters and puts out 275 horsepower and 273 ft-lbs of torque -- which doesn't sound too bad, until you realize that the W8 wagon tips the scales at 4000 lbs, compared to a FWD 1.8T sedan at 3000. The extra 75 horsepower over a chipped 1.8T isn't enough to overcome the additional mass and only the traction benefit of 4WD at low speeds helps maintain any semblance of performance advantage-- but the W8 gives nice thrust at highway speeds and would probably sound properly burbly when uncorked. All W8 equipped Passats came with Haldex based 4Motion all-wheel-drive, but this one uses the rarely seen 6-speed manual. Enjoy the manuals while you still can, because the Uber / Google / Facebook bubble cars are coming to a parking lot near you...soon. If I wanted a credit limit defying complex-car experience right now, of a Teutonic persuasion, it would be a 540 over this Vee-Dub. 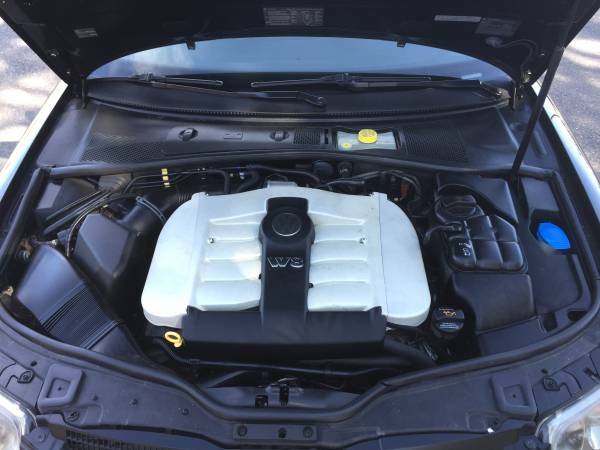 Nice enough car that with a couple of "issues," could double your purchase price. This was not a sterling period of reliability to value equations at VW Group AG. This is the kind of car you add to your collection and never drive. Wait, there's a wagon included too? "It displaces 4.0 liters and puts out 275 horsepower and 273 ft-lbs of torque -- which doesn't sound too bad, until you realize that the W8 wagon tips the scales at 4000 lbs, compared to a FWD 1.8T sedan at 3000." Perfect example of the spec sheet translated by a depraved sadistic babble fish into product. I think the depraved, sadistic babble fish was Ferdinand Piech. There are two kinds of W8 Passats - those that need an engine replacement, and those that will. Last time I checked, which was probably five years ago, there were exactly zero W8 longblocks in VW's inventory system.